Kheti, buried in tomb 17, is the son of Baqet and the governor of Oryx nome. the open chamber originally had six slender papyrus columns, only two remain. IT's is obvious that they were only decorative, as they hang freely from the ceiling. 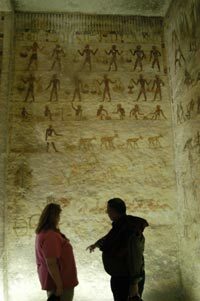 His tomb is decorated with scenes of hippos, hunting scenes, dancer and senet players, musicians, and offering scenes. The rear wall has scenes of wine-making and vineyards. 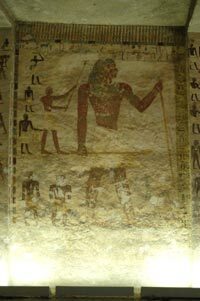 It is very similiar to the tomb of Baqet III, with many of the same scenes painted inside. A fine scene of Kheti's boats, near the entrance, is well-preserved. 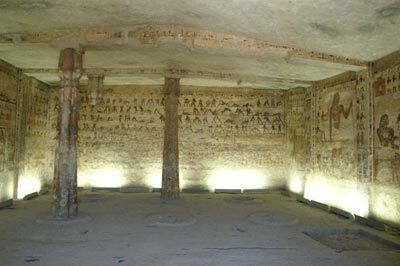 Otherwise, the artistic level of decoration in this tomb is inferior to the others on the ridge. 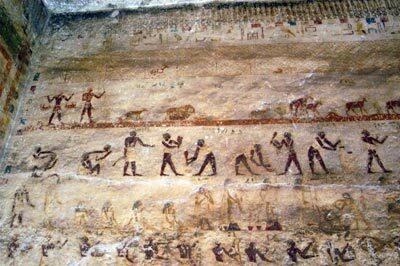 THere are scenes of copulating animals, a particulaly Old Kingdom motif, and the first of the elaborate wrestling scenes. Some believe the scenes are painted there because Kheti was an afficianado of the sport, others apply more symbolic meaning to them -- the black vs white wrestlers represent struggles of life and darkness.